I added a whole lot of products to my makeup collection recently both from the drugstore and higher end categories. As soon as I bring home new items I dig in excitedly and try everything out, in fact it's not often that I can actually walk in the door without swatching items on the back of my hand. Some of the items are from the Mary Kay line which I purchased during a small charity makeup party I hosted in my home a couple of weeks ago. I love makeup and it was for a good cause so why not, right? I'm not in love with everything I chose but I am pleasantly surprised by some! I plan to do full reviews on each of those items so I'll definitely give you all the details another time but for now I incorporated some of those new items into an eye makeup tutorial. When I purchased some of the Wet N Wild 8 pan palettes a while back I promised a eye makeup tutorial using this blues one and finally I've done just that. It's meant to be a pretty glamorous party look so I did some winged liner and false lashes! 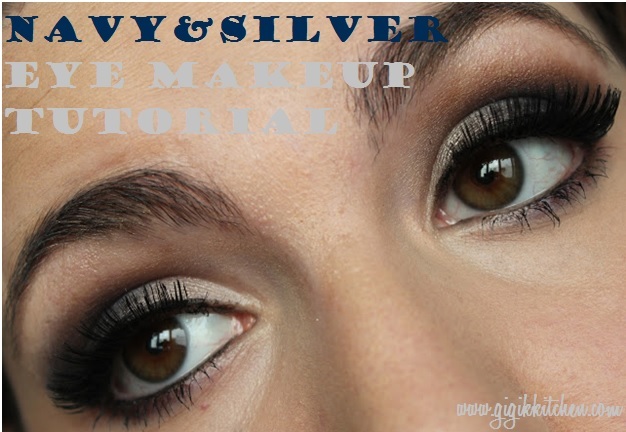 If you want to see how I got this navy and silver eye makeup look then go watch this weeks youtube video here or read till the end of the post where I will insert it as usual. A few simple items are needed so feel free to use whatever you have in your collection if you'd like to recreate this look. If you do so, please send me some photos through instagram, facebook, twitter or any of my other social media platforms, I would absolutely love to see! Mary Kay Cream Eye Color in "Glacier Grey"
Loreal Color Wear Infinite Shadow in "Deep Mocha"
Bare Minerals Ready Eye Shadow 2.0 The Top Shelf in "Mixologist"
1. Apply the silver cream shadow all over the lid from lash line to crease using a flat shader brush or your fingers if you'd like. 2. Using a blending brush and add a medium brown shade to the crease of the eye and blend back and forth in windshield wiper motions. 3. Add a dark grey-blue shade to the very outer corner of the eye and blend. Then add a brighter shimmery or sparkly blue shade to the center of the lid. 4. Add some of the medium brown shade to the lower lashline with a small angled eye brush. Add some of the brighter blue shade to the center of the lower lashline. 5. Line the lower lashline with a black pencil liner. 6. Line the upper lash line with some black liquid liner winging out the corner. 7. Highlight the inner corner and brow bone with a light ivory shade. 8. Put on some false lashes using a dark lash glue. 9. Apply mascara to the upper and lower lashes. Would you wear a look like this one to a party you attend? Let me know what you think of it in the comments form, I love hearing from you!